There's been lots of stuff I should have posted about this month. Now I find myself trying to get all done in the next few days. You'll find these purses in the April issue of Homespun. They were made last year and I'd forgotten just how lovely they are. I don't have a favourite! There is something very nice about seeing one of your projects in Homespun. In this months issue you'll find my Delightful Blooms project. This little purse is perfect for putting together over a weekend. A few hours here and there and it will be finished in next to no time. Kits (materials, spring strip and chain) are available for $22.50. This includes P & H within Australia. Spring strip and chain only are also available. If you would like to make a purchase simply email your order to marglowdesigns@bigpond.com and you'll be sent a PayPal invoice. You will find my block in this months issue of Homespun. I have lots of favourites things and samplers are just one of them. A sampler seemed the perfect choice for a design celebrating life. If you are making this quilt, personalize this block with those things meaningful to you. Stitch the names of family and friends or those things you can't do without like chocolate, desserts......whatever you decide to do, just make sure you have fun with it. I have to say that I feel like I've been chasing my tail ever since I got back from Adelaide. There are so many things I need to tell you about. The giveaway Barb and I have in this months issue of Homespun is just one of them. The pack includes the patterns A Celebration and Christmas Charm and 5 Theodora Cleave buttons or tags (NB the buttons and tags may vary from those pictured here.) 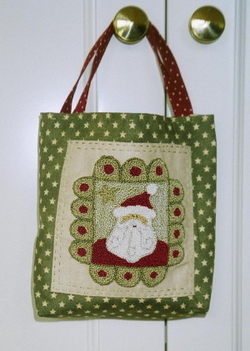 For details on how to enter, please see Homespun's Hope Chest in The Christmas Issue Vol 10 No. 7. Something I did find, when I was searching for the stitchery were these. Gift cards I designed for the April 2007 issue of Homespun. This got me thinking about these lovely buttons of Barb (Theodora Cleave). They are so cute I can't pick a favourite, but there is something very special about the blue bird tag. So after some sketching, measuring, cutting and stitching here is the first one. Now I do have plans to make more, I really want and need to make more but the urge to see whether another project recently started, is going to work is very tempting. Plus March is a very busy month for me, with three birthdays to make presents for. Now I knew this was happening, so why aren't I more prepared! Kay, from Avonleigh, visited friends at Kinglake last Thursday and helped put a smile on some faces. How simple gifts can bring so much pleasure. I've put off writing about this for a few days now. Somehow it doesn't seem right that everything is as usual for me when others have suffered such devastating losses and continue to be under threat from the fires. I do know there was a time when I just needed to do a little stitching. A bit of 'normal' when everything else had been turned upside down. You'll find this project in the February issue of Homespun in the Bag Special. The Bird of Happiness Purse. This incorporates all those things that are special to me. Birds, flowers and some stitching. It's small, as nearly all of my designs are. Perfect to make for yourself or as a gift. And because I always find it difficult to stop at one, here it is in red. The samples are on display at Avonleigh. The November issue of Homespun arrived in the mail today and I couldn't wait to sit down and have a read. There's a DVD by Christine Book and a punch needle project by me. This is a rushed photo of the project taken just before I posted it off. The punched Santa is approx 4 1/2 inches square and would fit perfectly in a 5 inch frame. I have another one on the go and this one will be stitched onto a little pillow. Just another thing to add to my to do list. Jan has sent me some photos of our weekend and I finally worked out how to transfer them from her email to the album. Yes, I was just a bit technically challenged. Should I admit I have been trying to do it off and on all day? For those girls on Sunday who over heard Christine talking about a photo I took of her - NO - I'm not going to post it. I value her friendship too much.